If you have surfed this site, hopefully you’ve come to the conclusion that anyone giving advice to clients over the age of 60 must know Medicaid planning. Why? 1) Because not knowing and not incorporating Medicaid planning into a financial/estate plan for clients over the age of 60 can get you sued (and knowing it will allow you to provide better advice). To get a feel for the importance of Medicaid planning for seniors, please click on the following client-information video. (To inquire about how you can use this video to educate an motivate clients, please click here). 2) Opportunity. There are 7,000 people turning 65 every day in America and because there will be 40 million people over the age of 65 by 2040. 3) Opportunity. Very few advisors know anything about Medicaid planning (meaning your local marketplace is wide open). 4) Income. Because of 2) and 3), advisors who know this subject matter can greatly expand their ability to earn a living. 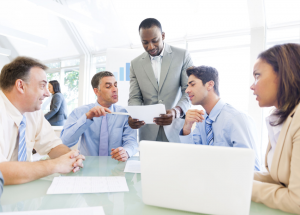 Insurance agents can properly sell annuities and life insurance, and attorneys can create a significant amount of legal work. What’s the problem then? What are you waiting for? The problem is that Medicaid planning is not a simple subject matter, and there is nowhere you can turn to learn proper Medicaid planning techniques. Through MedicaidPlanning.org, you now have a few different ways to learn and provide proper advice to your senior clients when it comes to Medicaid planning. 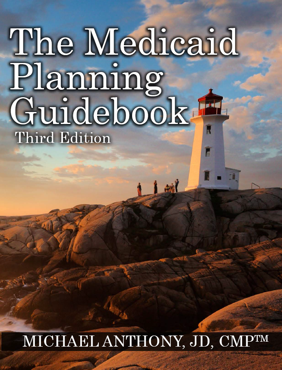 -Now advisors can use The Medicaid Planning Guidebook as a desk reference guide to help them in their day-to- day interaction with clients (no advisor giving advice to clients over 60 should be without this training/reference manual). Click here to learn more about this Guidebook and how you can order one. 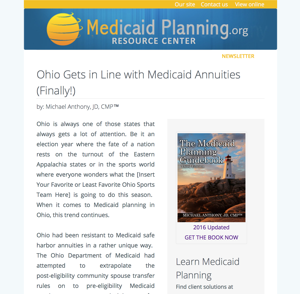 -Now advisors of all kinds can learn from one of the top Medicaid planning experts in the country, Mike Anthony, JD, CMP™. There is no doubt that there has been an educational void in several professional communities when it comes to Medicaid planning. Because of this there are literally millions of seniors who are not setup properly to shield their wealth from the devastating costs of a nursing home or home-care-expenses. That void has now been filled by MedicaidPlanning.org, and we strongly recommend that you take advantage of our resources to insulate yourselves from lawsuits, to provide better advice to your senior clients, and to grow your business/earn more income. For more information about working with MedicaidPlanning.org, please click here. If you have questions for us, please e-mail info@mediciadplanning.org.